Minister for Work, Transport and Communication Prof Makame Mbarawa, right, exchanges documents with his Uganda counterpart Mr Bagiire Aggrey. 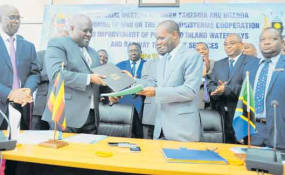 Dar es Salaam — Uganda and Tanzania trade is heading into a milestone after the former opted to sign a Memorandum of Understanding (MoU) on Cooperation and Improvement of Ports and Inland Waterways and Railway Transport Services. The MoU will see Uganda, one of the East Africa's landlocked countries, use the port of Dar es Salaam for transporting its cargoes, The Citizen can reveal. Uganda deems the port of Dar es Salaam as cost effective for transporting its cargoes. Uganda's minister for Transport Mr Bagiire Aggrey said this yesterday during the signing ceremony of the MoU, explaining that the decision is in line with their plans to improve business of Ugandans within and outside the country. "We hope that the cost would even go lower after the completion of the Standard Gauge Railway (SGR) project from Dar es Salaam to Mwanza where there is a waterway connection with Uganda," he said. According to him, the government of Uganda was happy with how Tanzania has improved the Dar es Salaam Port, which provides a good link to other land locked countries. Mr Aggrey said they had an option of using the Mombasa port, which is the shortest route to Uganda with 1,200 km only, compared to 1,800km from Dar es Salaam, but they preferred the latter. The minister added that the cost of transporting coffee by train is $120 (about Sh270,000) per ton with an efficient and effective water transport. "With this improvement, the government would save $40 million per year," explained Mr Aggrey. For his part, Tanzanian minister for Works, Transport and Communication Prof Makame Mbarawa promised that the government would keep improving the entire transportation sector with a view to attracting more clients from the neighbouring landlocked countries. He said the SGR project would minimize the delivery time of the Ugandan cargo to Kampala, since the cargo will be arriving at the destination within 24 hours.